Shortest path to section of Bog Road will increase from seven miles to 21 miles for Fairfield Fire Department. 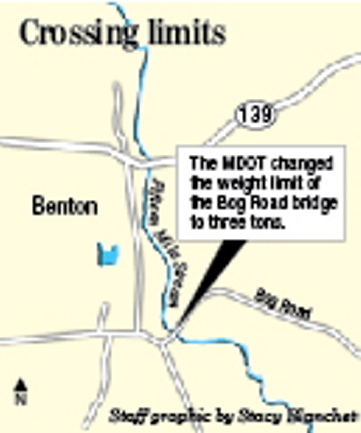 BENTON — A new weight limit on a Bog Road bridge will force large vehicles, including plows and fire trucks, to make a long detour if they want to access a part of the road. The East Benton Bridge, which crosses Fifteen Mile Stream, was restricted to a weight limit of three tons by the Maine Department of Transportation on Tuesday. “It does impact us, because we can’t go over the bridge,” Fairfield Fire Department Chief Duane Bickford said. “It would be quite a detour.” He said the restriction turns a trip of about seven miles for the department into more than 20 miles. Bickford said this is the first time he’s seen a bridge weight limit affect emergency responders in this way in his more than 20 years with the fire department. Up until this week, the Fairfield Fire Department was the primary responder to emergency calls on the stretch of Bog Road past the bridge, which includes parts of both Benton and Albion. Now, responders will have to detour around the bridge by continuing on East Benton Road to U.S. Route 202 in Albion, increasing the drive to 21 miles. Along the way, emergency responders from Fairfield will drive past the Albion Fire Department, which is about 15 miles from the area. Bickford said he has told dispatch services to consider Albion’s department the primary responder to that area for as long as the weight limit is in effect. Andrew Clark, chief of the Albion Fire Department, said there aren’t many residences on that stretch of Bog Road, but fires do happen there, with the most recent one being about three years ago. A three-ton limit allows cars and light duty pickup trucks to cross the bridge, but excludes traffic from fire trucks, oil delivery trucks, school buses and dump trucks, according to a release from the state department. The average school bus weighs about seven tons, while fire trucks typically weigh anywhere from about eight tons to as much as 40 tons. Plow trucks can range anywhere from about three tons up to 25 tons. Len Poulin, the town of Benton’s plowing contractor, said the three-ton limit will take money out of his pocket. “It’s a little difficult to access it now without doing the scenic countryside tour of Albion,” he said. Poulin said the bridge itself, which has a perforated steel surface, doesn’t always need plowing. When it does, his crew might still be able to plow the bridge itself with a light pickup truck. In order to plow Bog Road, heavier plows trucks will have to go the long way around, which will cost as much as an hour of time with each snowfall, as well as add fuel costs for a vehicle that gets about four miles to the gallon. Poulin said Bog Road might take longer to plow, but he doesn’t anticipate the delay will cause problems, because it is usually one of the last roads he plows anyway. Fairfield-based School Administrative District 49 does run school buses through its area of Albion, Benton and Clinton, but no buses currently cross the East Benton Bridge, and so the district will not be affected by the change, according to Cheryl Brackett, transportation director. Todd Hunt, the Benton’s road commissioner, said he was surprised at the dramatic weight reduction, the second within the past year. “It kind of blindsided us,” Hunt said. About a year ago, Hunt said, the weight limit on the road was reduced to 10 tons. He said he wasn’t sure why the limit was being changed now but that it could have more to do with a change in regulations than a dramatic deterioration in the bridge. According to a recent report from the state transportation department, 288 of the state’s 2,722 bridges are at risk of being posted with a weight restriction or closure within 10 years, unless repairs or replacements occur first. At least 69 of those bridges already have weight restrictions. In regularly published bridge maintenance reports, each bridge in Maine is rated good, fair or poor depending on the condition of various features, including the structure of the bridge, its deck and the underlying substructure. According to a July bridge maintenance report, the 66-foot long bridge, built in 1956, was last inspected on Aug. 23, 2012. At the time, the East Benton Bridge’s substructure and superstructure were both rated a 5, or fair. The deck condition was rated a 6, satisfactory, and the channel condition was rated 7, or good. If any component of the bridge gets a five or a six, the bridge is considered to be in at least fair condition. Scores of four or below can merit a rating of poor. A bridge in fair condition is considered to have a sound structure, but may have some minor section loss, cracking, or other forms of deterioration. Hunt said the state department has told him the bridge is scheduled to be repaired and widened sometime in 2014. Because the detour is so lengthy, traffic will be handled during the work period with the use of a temporary stoplight, he said. Ted Talbot, the public information officer for the Maine Department of Transportation, did not return calls seeking comment.